When the occasion is special, the recipe should be a special one too. Yup!! Garlic rolls have made me drool in dreams and also has been a nightmare for me since I terribly failed making buns last occasion. Grind the coriander leaves and green chilly into a fine paste. Mix it along with butter and salt. Drop the yeast, salt and sugar in warm water and beat until everything dissolves. Add the sifted maida to the above ingredients and kneed well until you get a smooth dough. Finally add olive oil and kneed for a while till the dough springs back when you press with your finger. Leave the dough in a greased bowl and cover it with cling film or wet cloth. Allow it untouched for an hour. The dough will double in size by then. Now knock down the air in the dough and kneed again for few mins. Divide the dough into two parts and roll it into a rectangle using the rolling pin. The rolled rectangle should be half an inch thick. Apply the garlic butter on the dough evenly. Now roll it carefully into a log and cut it into four equal parts. Do the same for the remaining dough too. Place them into a well greased baking tray or bread loaf tin. Now apply the remaining garlic butter spread on top of the rolls and also apply some milk on the sides and top to give the rolls the shiny look. Sprinkle some sesame seeds on top of the rolls. Now leave this along for another 20 mins for it to slightly raise in size. Bake the rolls for 25-30 mins. This quantity would make 8 big garlic rolls. You can use half the quantity of maida and replace the remaining half with wheat flour. You can store the rolls for a day or two. 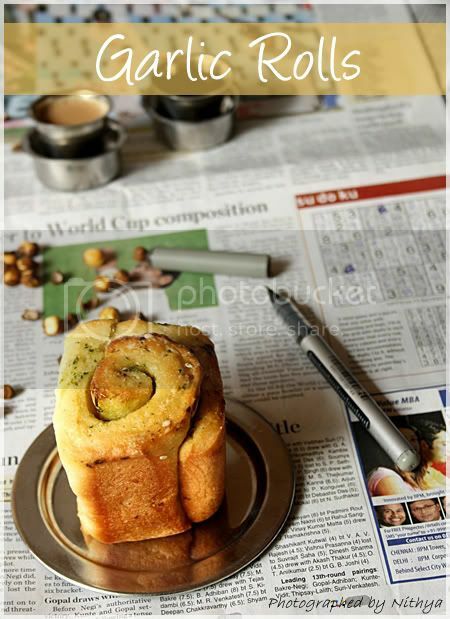 Awesome looking garlic rolls....And as usual great clicks this time with the setup of teatime, looks so natural and nice. Though I cleared the doubts in the beginning u gave me the idea for perfect shaped rolls which made/tempted me to try again :) he he Will post my version sooner too. 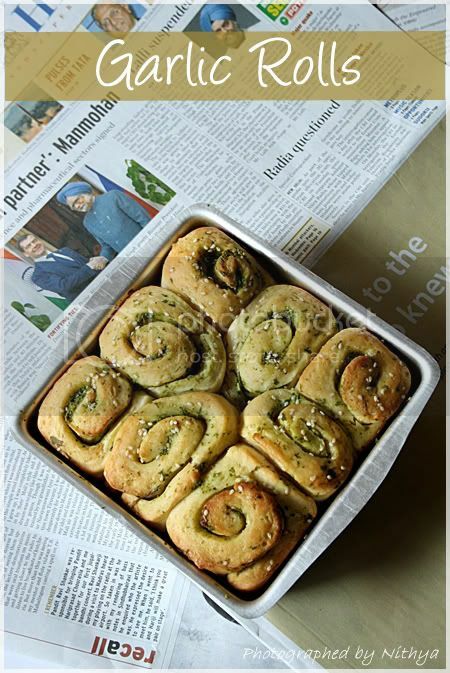 Garlic rolls looks fantastic.. wonderful clicks too... nice presentation. 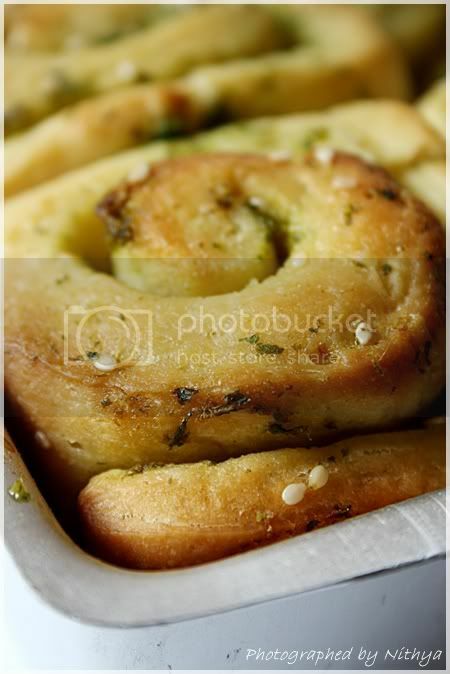 Yumm, garlic rolls looks absolutely fabulous Nithya, u r tempting and pulling me to make some today..beautiful clicks.. I tasted this and fell in love with this. I started to melt in the smell of garlic! Feel like having more and more. The second picture is extremely good. Good going Nithi! Wish you all the very best for 2011 and hoping to see more and more and more recipes from you... Happy New Year!! 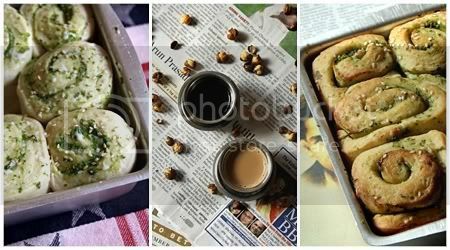 awesome recipe and great clicks. Rolls look so yummy and inviting. I am tempted to prepare these beautiful rolls.. I like anything with garlic and these rolls looks so perfect lovely and tempting. Looks so delicious and flavorful..love to have bite! Congrats on ur 100th post nithi... Loved the garlic rolls..looks so yumm and perfect. Congrats Nithya,garlic rolls look delicious. wow, they have come out soooo well, flaky and soft. Looks absolutely perfect Nits..Classy photos..
Garlic rolls looks wonderful ! Congrats On ur 100th post ! Looks inviting and tempting. I just love garlic bread and rolls. Have bookmarked will try soon. Congrats. 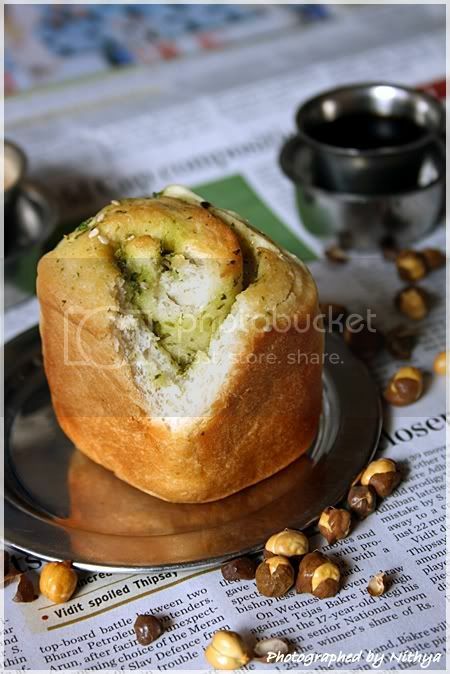 this is one amazing looking garlic roll! and i loove how you used newspaper as background, very unique Nithiya! Aww! 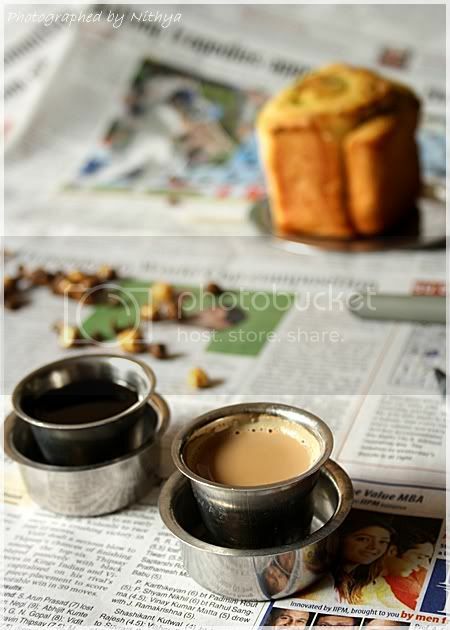 Love the feel of the photographs reminds me of home :( chai and rolls! Fabulous. Sudoku in the background. My mothers favorite. Your prepration and the photos looks nice. Hey Nitya! What a co-incidence! I made garlic bread too and at the moment its sitting on the rack cooling. Lovely pics! A very Happy new year to you n ur family Nithya. Love the Garlic rolls .. truly a visual treat !!! Garlic Roll looks great. Photos are very tempting. Great meeting & knowing you. Enakku davara tumbler coffee dhaan venum. nothing else. I'm really going to get up and go make some coffee for me now and have it in a stainless steel cup. I love the addition of green chilly....these are absolute favorites with my kids...love ur clicks. YUM!!! what a great idea!!! I love garlic and I love rolls! I've only had cinnamon rolls, this is such a great idea!